A self fulfilling prophesy? A deflationary spiral is when a decrease in price leads to lower production levels, which then triggers lower wages and diminished demand, which then leads to even more decreases in prices. So it is a spiral but also a vicious circle that feeds itself. As buzzwords go the word “uncertainty” does not rate as the most evocative but we are stuck with it, at least until the next financial demon distracts our attention to horrors new, for instance the word unemployment. It may not be the stuff of epic poetry but “uncertainty” has taken the global markets by the scruff of the neck this week and is giving central bankers and investors the jitters. Only a few weeks ago we thought we were walking cautiously down a rocky road towards the semblance of economic and social normality but all of a sudden we are about to stumble into a spiral of deflation. So what is this beast? Technically speaking, deflation is a decrease in the general prices of goods and services. You know it is happening as it is when the annual inflation rate turns negative which leads, paradoxically, to an increase in the value of your money, as you can buy more goods with it. This is not to be confused with disinflation which is just a slowing down of the rate at which prices increase. To the layman it means that prices and wages spiral down and the economy enters a type of paralysis as people stop spending. So what is the fuss all about? The fuss is really about the fact that deflation has made it on to the agenda of the Federal Reserve Bank which in the arcane crypto- speak of that august institution implies that they are taking the issue very seriously. 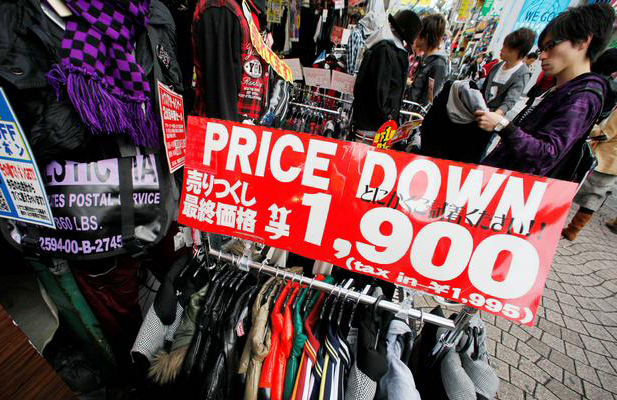 The fuss is also about making sure that the US economy does not follow that of Japan down the road to deflation, Japan is a country that is still suffering deflation twenty years on after a massive property and stock market bubble burst. It is still an economy in a state of paralysis. This is a road that Ben Bernanke does not want to take. Deflation is a frightening prospect mainly becuase it leads to a deflationary spiral where prices and wages perpetually decrease. Those that are seeing deflation around every corner say that stock, housing and commodity prices are about to collapse and that there will be a rush towards government bonds which will have become the only safe haven in a dangerous period of economic stagnation. People will hold on tight to their money as by not spending they are technically making money as inflation is not eroding the value of their money and the purchasing power of their money is rising simply because prices are falling. Deflationary spirals can also lead to liquidity traps. This term refers to when the treasury is no longer able to stimulate the economy by injecting money into the economy and thus lowering interest rates. You cannot get a straight answer from economists. There is currently an almost 50-50 split between economists who are most worried about inflation and those who are most worried about deflation. There are even those that say that there is good deflation and bad deflation. There is price deflation which is the result of healthy competition with companies undercutting each other through innovation or outsourcing (all part of capitalist development) and there is bad deflation when the money supply collapses as a tool of economic policy, when you can no longer stimulate the economy by printing money, playing with interest rates or through quantitaive easing. You are really flogging a dead horse, or at least pointlessly throwing money at it. There are even economists who only see the positive side of deflation – prices decrease and the value of your money increases, end of story. Confused? The global markets have been trying to identify the beast they need to fight for nearly two years now. The current “uncertainty” buzzword is just a way of saying that investors are not feeling secure enough to dive back into the water and invest freely, they are partially holding back. That uncertainty may be putting the squeeze on the market and leading to a sort of psychological paralysis – which is how deflation begins. Basically, deflation sets in when the fear of inflation disappears, if inflation is not eroding your money then why not just hold on to it? A deflationary spiral is when a decrease in price leads to lower production levels, which then triggers lower wages and diminished demand, which then leads to even more decreases in prices. So it is a spiral but also a vicious circle that feeds itself and that is why it is so dfficult to move out of. The Fed has an impossible problem. It is facing rising unemployment, short term interest rates which are near zero, which some say are not even doing the trick of stimulating the economy – which others say no longer needs stimulating, meaning that they think the Fed should actually be raising rates. So is the economy much more robust that it appears or much more fragile? Nobody knows and hence the uncertainty which leads straight on to deflationary fears. Bernanke is a lonely man. Deflation is all in the mind, if people tell you prices are going to go down you will change your spending behaviour, almost unwittingly, and wait before buying anything to see if the price will go down further, of course it does, and hence the downward price spiral becomes a self fulfilling prophecy. Then it becomes philosophical, does the mere expectation of deflation become real deflation by definition because you have altered your mindset and put yourself on pause to defend your assets and capital? The answer may well be yes, which is why many people wished that the Fed had never even mentioned the D word in the first place.